In an Evil World, Does Goodness Pay? The question as to how much impact 'goodness' can have in an evil world remains puzzling. If everyone else is 'succeeding' by behaving ruthlessly and obliterating the concept of empathy, why should I myself remain honest and ethical? In a chapter of his upcoming book, Corporate Serial Killers, John Uustal tells the story of how his law firm almost went bankrupt when he and his partner fought against Ford/Firestone on behalf of families who had lost their loved ones in accidents caused by defective vehicles/tires. He recalls fighting against an army of corporate lawyers, with the limited resources of a young firm, facing opposing attorneys he had never seen before, having to station people outside a judge´s chambers in order to avoid the case being dismissed on a technicality, and basically not sleeping for months in order to measure up to the Goliath of a company willing to spend millions to sweep corporate misconduct under the rug. In their everyday life, attorneys like Uustal have to stare right into the face of evil. This is not something that happens to all of us. It is one thing to be attacked by a criminal on the street, for example, and a very different thing to witness how a company calculates how much it will cost to pay off the families of the consumers their defective products might kill, deciding that, even after putting aside hundreds of millions of dollars for settlements, it will all still be good business. In another chapter of the same book, Uustal tells the harrowing story of how tobacco companies explicitly said in internal memos something along the lines of, “we are in the business of selling an addictive drug,” and how they knew cigarettes could kill, as far back as the 1930s, and still marketed them to children. Think of that for a moment. Corporations putting a death sentence on children in order to make money. Uustal fought on behalf of a woman who needed a lung transplant and, although a court ruled she should receive millions of dollars, the appeal process is still ongoing, and the woman is already dead. 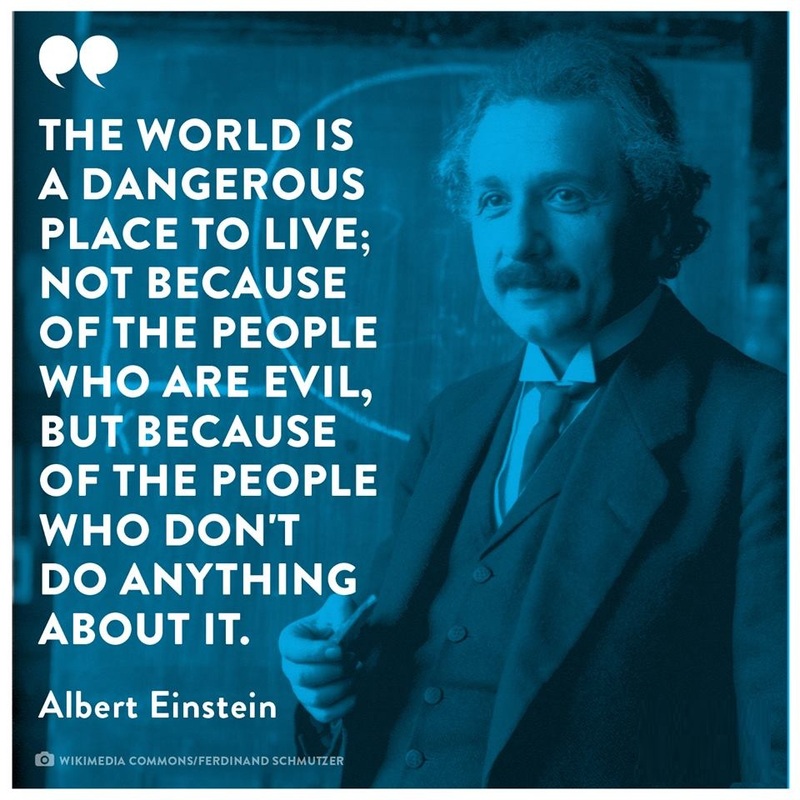 As Albert Einstein said, the apathy of honest and good people has a bigger potential to spread evil than the conduct of the perpetrators of evil themselves. Yet the question as to how much impact ‘goodness’ can have in an evil world remains puzzling. If everyone else is ‘succeeding’ by behaving ruthlessly and obliterating the concept of empathy, why should I myself remain honest and ethical? Is it not overly naïf to work towards the common good when CEOs calculate the value of human lives and presidents attack immigrants based on the color of their skin or the size of their wallets? What is the meaning of goodness today, in short, why fight for good? As modern media try to transform people from thinking individuals into voracious consuming machines, ideology and politics have an increasingly bad rep. And it in this context that the evil-begetting apathy thrives. Often, we fail to realize that WE are THE PEOPLE. We complain about the state of things, the evil of corporations, the inequalities and injustices of the world, and we often forget that we have the power to change ourselves and those around us. If an attorney fresh out of law school who just started their firm can risk losing everything to save one client’s life, there are a thousand things you as an individual can do every single day, to make the world a better place, and with infinitely smaller risks. I believe we need freedom and justice fighters who can inspire us. And we need to pay attention to the message they give by example. In the end, the world is only as evil as you perceive it, as you allow it to be, with your actions, with your thoughts that shape emotions and ideas. Cognitive psychology has taught us that we can think a state of mind into being, by what we focus on, by what we discard or ignore. So, when you feel like your personal goodness and positive attitude has no impact, think again. The happiest people in the world are the ones who live in tightly-knit communities, one prominent study found, and realizing the power of goodness to impact your community is certainly the right path to both individual and communal happiness. Award-winning poet, editor, translator, journalist and film producer. A digital nomad who divides her time between the U.S., Greece, and Uruguay. Aspiring chef and Uruguayan music activist.